In assembly on Monday, we have been learning about people that live and work on rubbish dumps in countries such as Cambodia. They work for less than $1 a day to collect rubbish for recycling. 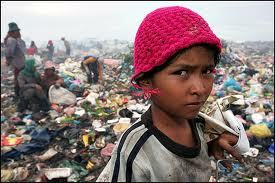 Children also work on the dumps and aren’t able to go to school because their family need the money they earn. Can you imagine having to do that every day? We have used what we have found out to help us think about the importance of recycling. In the afternoons this week, we are working in teams to create a piece of artwork from recycled rubbish to help us think about the life of people like this across the world. Parents are invited to see our artwork on Friday after school in the hall. Tell everyone on this page, how you feel about this and how artwork is helping you think about these people who have to work on rubbish dumps. Its horrible! The artwork will help the people change their lives and how they work in these dumps. though would it Lauren? Because even though we were recycling, it is their job to savage round so they can earn money. If we do that we will make more people die for they have no money to buy food. Of corse that is an exellent idea. Charlotte most people die when they dont have any food or water anyway. Here is a question if they die when there dont have any food or water how many peoplewill be alife . My afternoon group have been looking at an artist, Alison Harper, who created pieces of art using crisp packets. I have emailed her your questions and hopefully she will respond soon! Who knows…she may visit our blog! These are some of the questions I have emailed Alison Harper. I hope she can answer some of your questions. Kelsey, Kiki and Amie would like to know: How long did it take you to make the hair slides? Where did you start? Kimberly would like to know: Do you always get it right first time? Which piece of art are you most proud of? Ellie-Mae, Jack and Jay would like to know: What inspired you to start using crisp packets? Jodie would like to know: How did you think of so many different thins to make? Do you sell your art or keep them? Maisie and William would like to know: Do you enjoy making things out crisp packets? Did you find it difficult? Billy would like to know: Did you do a design before you made them? If you have any other questions then add them on here. Hi, Alison here, thank you so much everyone for your interest in my work – I too am concerned about how much ‘waste’ there is in the world, the resources it uses up and where things go to when they no longer have a ‘use’. I am hoping that my work will make people think and that they will look at the world in a different way. This is an interesting one Kimberley – no I don’t always get it ‘right’ but the best part of doing something creative is that if you make what you think is a ‘mistake’ it can quite often lead you in another direction and you discover something new by doing this . So there is no ‘wrong’ – just different ways of doing things – I hope you can think about that when you are doing your own artwork. Which piece of work am I most proud of ? That’s tricky – with the crisp art think it was when I found a way of making little rings which people seemed to like. Making things is a process and so when you start to make things you will have ideas of other things to make – it is a lovely way to think and making things with your hands can make you feel really nice – do you find this – or is is frustrating sometimes ? I do sell my work sometimes – I am taking part in a an eco craft fair in London next weekend. Have you ever had a craft fair at your school – could be fun to show off your handiwork and to show other people how to make things. Interesting question Billy – lots of designers and artists do drawings and designs on paper or make models before making the final work – but I tend not to do that as once I have an idea in my head I generally can find a way to make it work. That is fine as I am working on my own – if I was part of a design studio say, I would have to communicate my ideas through drawing to other people. It’s great to draw, really good for your art and design skills . Draw, draw, draw – there is no wrong way to do this either ! I have a question for you – can you ‘guesstimate’ how much yarn I can make from one small/medium sized crisp packet ?? Thank you for answering my question. How can you make them little balls with crisp packets. Thank you so much for your time Alison! Hopefully the children will be able to apply your advise and ideas into creating a piece of fabulous art for our school! I will email you a photograph of our finished creation. Right my group…get thinking. Can you answer Alison’s question? Hi, thankyou for your excellent question. It really got them thinking. Jay estimates 2 meters, Oliver says 1.5 m, Thomas thinks 1.7m and Ellie-Mae 2.5 m. Please tell us if any of us were correct. They have been really excited about the whole project. We look forward to forwarding a finished design photo. I think it is good that we are using recycled materials as this could help the environment. Nice thinking lorena you have thought about it. thank you so much Alison for answering my question that is really interesting Thank You. It must really stink. I wonder if they have had enough o the smell and the job itself, i wouldnt last a minuite. It must stink but they only get 1 dollar a day which is about 63p! That is NOT a lot. I feel cros with the owner who gets paid to allow the rubbish to be dumped there. I agree though the might not have a park but at least have a decent home, not on a rubbish dump. people live on different lands some make me disgusted for their space and what they live on.